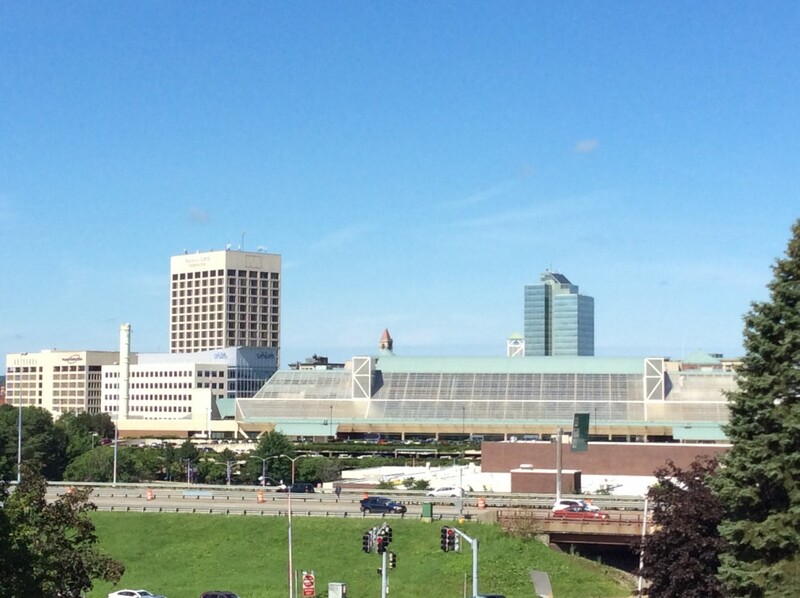 Is Worcester the worst city in America to live if you’re a person with a disability? That may be a question you never pondered. Maybe, though, it’s one you should. Using 25 criteria, a mix of economic and demographic data with a splash of, let’s just say, less-rigorous data, WalletHub presumed to rank the largest 150 cities in the country. Health care costs and the cost of living figure prominently is the criteria, which may explain why New England cities fared poorly and why 11 of the top 15 cities are in California, Arizona or Hawaii. According to the rankings, Worcester ranked dead last. Put another way, among the 150 largest cities in America, the city is the worst place for a person with a disability to live. “What are some unique financial challenges faced by people with disabilities, particularly those who use government programs? How can they be overcome? In evaluating the best cities for people with disabilities, what are the top five indicators? “I don’t think the idea of a numerical ranking of cities in something like this makes any particular sense whatsoever,” Gottlieb said. “You can numerically rank people who finish a marathon; that’s simple and easily quantified. But this is too complex an issue. “What it should be, I should think, is a wakeup call to the citizens of Worcester, in whatever way in which they function, whether it’s the newspaper or the government or the local faith communities or social action groups, to ask themselves a series of questions about the kinds of issues I and the other people raised. Is there affordable citywide transportation? … Do faith communities make an effort to include people? Is the level of … justice and inclusion, according to the ADA, Americans with Disabilities Act, is that taken seriously? Is the issue raised in an educational setting? 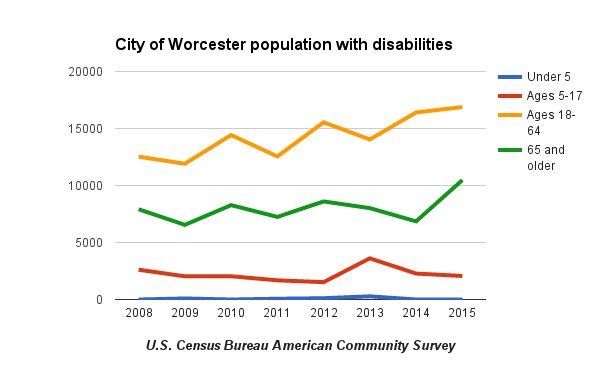 And they are questions that Worcester should address, if for no other reason than by any measure, the number of people with disability in the city is rising. 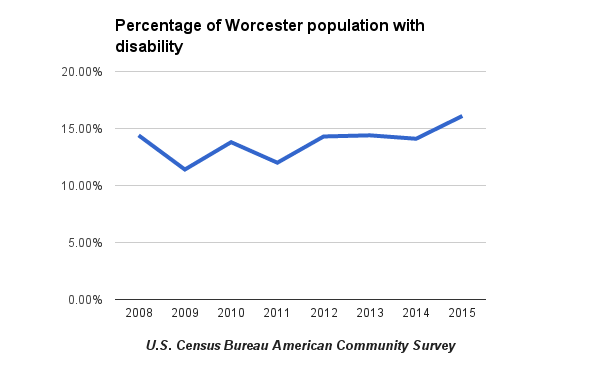 According to the U.S. Census Bureau’s 2015 American Community Survey, released in September, the percentage of the Worcester population with a disability stands at 16.1 percent, the highest recorded figure for Worcester in the ACS, which dates back to 2008. The 2015 percentage marks an increase of 2 full percentage points. By age group, those results are also striking. 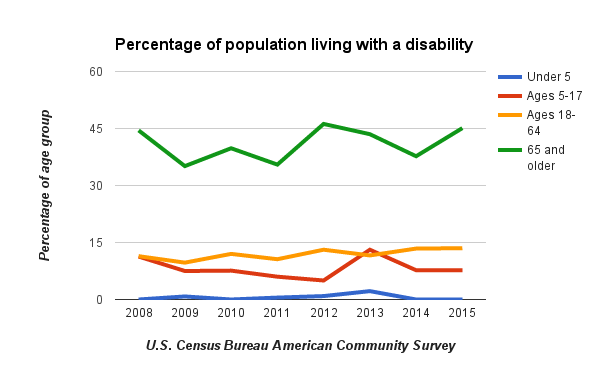 Among those ages 18 to 64, a record high of 13.5 percent of people in Worcester live with a disability. Among those 65 and older the figure is 45.1 percent, which represents a one-year increase of 7.5 percent but is short of Worcester’s all-time high of 46.2 percent in 2012. The raw numbers are equally staggering. The record high of 13.5 percent for people ages 18 to 64 represents 16.879 people. Among those 65 and older, the figure is 10,477, the first time the number among that age group has exceeded five figures. Economically, this population is not faring well. In 2015, the disabled represented 27.64 percent of the total population of those living in poverty. This figure, the highest recorded in the ACS, means more than 1 in 4 people in poverty is disabled. It’s a nearly 5 percentage point increase from 2014. 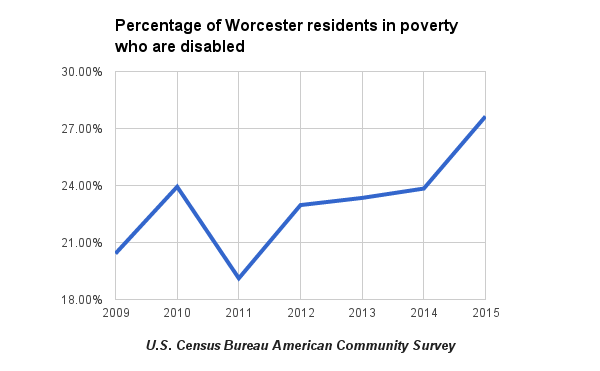 The numbers and trends do not portend good things for people with disabilities in Worcester. More importantly, we agree with his assertion there’s something to be learned. “I think it’s [a] wake-up call for every community everywhere,” he said. “I think that it’s very difficult. People are stressed out, they’re overworked, they’re overcommitted, and this just makes more work for people. In the end, what we can hope is that a flawed ranking can lead to a greater awareness of the issue and can spur positive change.